Love it!!! And my babies love it too!!! Good quality wood and carpet. Would buy again!!! Encourage activity and exploration in your feline family members with this 67-inch-tall cat tree. Constructed from solid wood for superior stability and longevity, this penthouse tree features two upper sleeping platforms that, while open, also offer high sides to keep your kitty from rolling off. 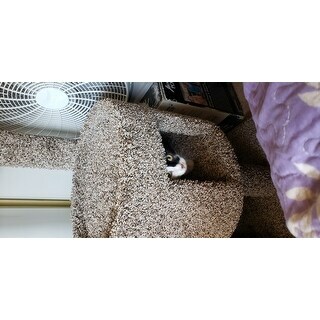 The lower enclosed cubby is perfect for cats who like to sleep in a cave-like setting for added security. Sisal rope and carpeting on the vertical poles provide your pets with safe places to sharpen claws and keep their nails trim without resorting to your nice furniture. I love to spoil my cats with cat trees. They really seem to love them. The Cat condo brand is the only brand I purchase now because it is made superior to other wobbly cardboard cat trees. It is wood and doesn't wobble with two cats climbing all over it. My 3 Cat Condo Cat tree over the last several years. This Cat Tree is built solid and is structurally very stable. A very well built Cat Tree that my cats took to immediately. I would recommend this to anyone looking for a quality Cat Tree for their cats too. We own a couple of these, well built, hard wood, heavy and does not tip. Our cats all love this item and take turns at which one area they use. Nice large roundness to them and deep too. Our cats love that. The height is perfect! 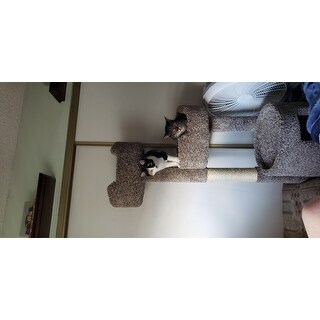 My little Kitty loves the enclosed part and it is easy for them to jump from level to level. Perfect for multiple cats! Large enough for my two babies to sleep together. Easy to assemble! The cat tree arrived promptly. It was packaged well. Easy to assemble. It was basically just what I expected. Was concerned that my larger, a bit overweight cat wouldn’t be able to fit in the opening of the little hideaway/cubby, but she was able to maneuver in it just fine. Would recommend. I have big cats and with other trees the rounds are shallow so they hang out over the sides. They eventually give up and find another spot to sleep. Not the case with this one. The rounds are deep enough to snuggle in and now has become the most cherished spot in the house. It has all the features I thought my cats would like. They, however, would rather play with a twist tie! I love it. Better than that my cats love it. "What is the height of the second bed from the floor? Thanks!"